Boxer's Calculator works just like a conventional calculator, and it has all the scientific and trigonometric functions one would expect to find on a full-featured calculator. Values can be entered by clicking keys with the mouse, or by using the keyboard. A list of shortcut keys can be found below. If a numeric value appears beneath the text cursor when the Calculator is summoned, that value will be placed into the calculator display automatically. The Calculator is also able to interact with the clipboard. The Copy button can be used to copy the value in the Calculator's display to the Windows clipboard. The Paste button can be used to paste a value from the clipboard into the Calculator's display. 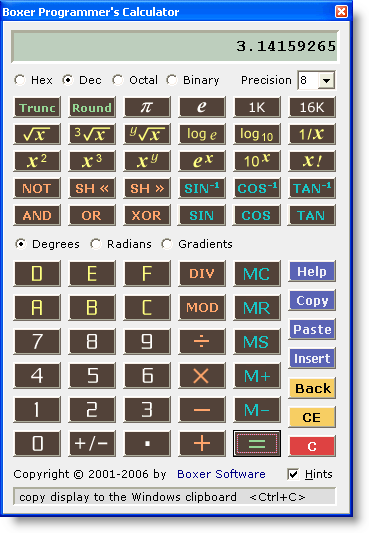 The Insert button will insert the value in Calculator display at the current text cursor location. Selecting the Hints checkbox reveals a small panel at the bottom of the Calculator that displays information about the key below the mouse cursor. The Calculator uses 64-bit arithmetic so that very large values can be entered and computed. Special thanks are due to Jonas Hammarberg for his help in this area. The Calculator uses the Algebraic Operating System (AOS), not Reverse Polish Notation (RPN).